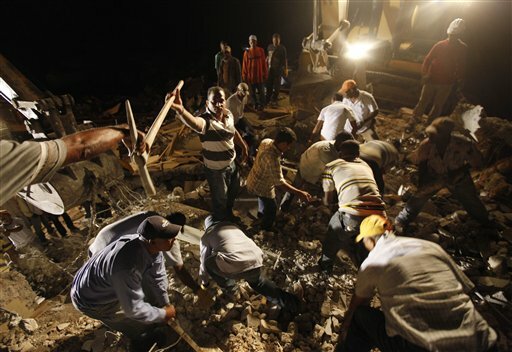 Rescuers work to free trapped survivors and find dead victims in a four story building that collapsed in the 7.0-magnitude earthquake in Port-au-Prince, Haiti, Wednesday, Jan. 13, 2010. 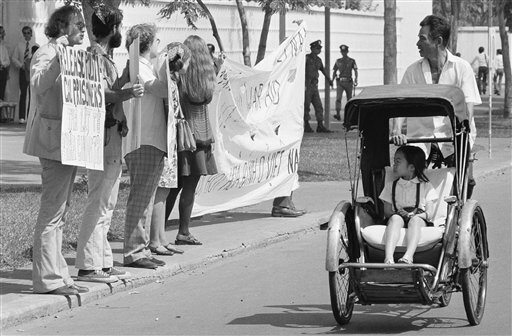 A little girl in a pedicab, and her driver stare as they pass a demonstration of nine anti-war activists before the United States embassy in Saigon, Friday, Jan. 25, 1975. The activists, led by David Harris, left, of Menlo Park, Calif. former husband of folk singer Joan Baez, passed out leaflets demanding the end of U.S. intervention in South Vietnam. 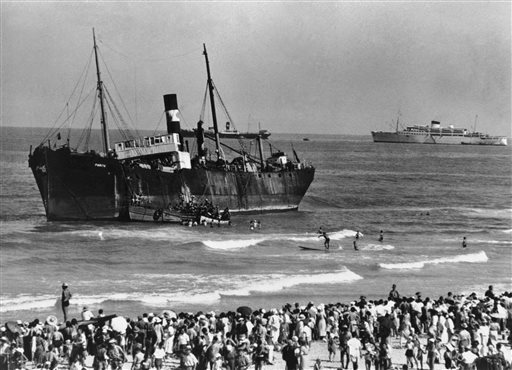 In this Aug. 22, 1939 file photo, the S.S. Parita, with 700 European Jewish refugees on board, lists after it was beached near the Ritz Hotel in Tel Aviv, an all-Jewish town in Palestine, under British mandate. The state of Israel declared independence in 1948. Political leaders in the national and state capitals this week began raising barriers against refugees coming to the U.S. from Syria and Iraq. They were responding to a sense of fear in the land that refugees might bring with them some of the dangers they were fleeing. Such fears escalated sharply after the deadly terror attacks in Paris on Friday, the 13th— a November night of random slaughter that took at least 130 lives and wounded hundreds. 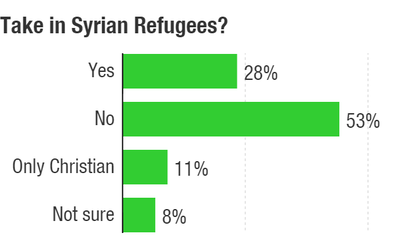 Polls throughout the week showed clear majorities of Americans supporting at least "a pause" in the resettlement of refugees from the region being roiled by the self-proclaimed Islamic State. For all that America prides itself on being "a nation of immigrants" symbolized by the Statue of Liberty with her lamp beside a golden door, the U.S. is also a nation of people — subject to human insecurity and fears for safety heightened over the past decade. Within 48 hours of the attack, Michigan Gov. Rick Snyder had called for a pause in refugee resettlements. The Republican&apos;s state is home to a significant Muslim population and might have been a logical destination for many new arrivals. Within a day, a majority of the nation&apos;s governors had joined Snyder or gone even further. In Tennessee, a GOP legislative leader called for Syrians already resettled in Nashville to be rounded up and turned over to federal authorities. On Thursday, the U.S. House voted overwhelmingly to suspend the resettlement of Syrian and Iraqi refugees until each and everyone could be certified as safe by the heads of the FBI, the CIA and the Department of Homeland Security. "From a law enforcement perspective, the bill presents us with an impracticality," Attorney General Loretta Lynch said. And FBI Director James Comey, one of the three officials charged with certifying the refugees as safe, noted, "It would be very, very difficult to say of anyone coming into the country that there is zero risk." Despite the big bipartisan majority vote, perhaps no one expects this House bill to become law. It will be altered in the Senate, and it has drawn a veto threat from the White House. Nonetheless, it had to happen — if only to defuse the explosive atmosphere of anxiety even on Capitol Hill in the wake of the horrors in Paris. All these politicians were giving voice to the powerful popular impression — visible in much of the media — that lax policies and porous borders could expose Americans to the same sort of violence visited on the French. Prosecutors said Friday they determined that two of the suicide bombers at France&apos;s national stadium had passed through Greece last month. Greece is a common European entry point for many refugees because of its proximity to Syria. It scarcely seems to matter, however, that the core of the Paris problem is that principal players were European nationals — or that the supposed mastermind was radicalized in a French prison. 2010 — Haitians: The earthquake in Haiti in 2010 increased the already strong incentives for Haitians to attempt the hazardous seaborne transit to the U.S., whether legally or illegally. Given the new devastation in the island nation, the U.S. relaxed its usual policy of deportation for undocumented Haitians already in the U.S. illegally, granting them Temporary Protected Status. Similar status had been granted to arrivals of other Latin American countries after earthquakes and hurricanes. But the idea of accepting new Haitian immigration because of this disaster was strongly resisted both in Florida and beyond. 1980 — Cubans: In the summer of 1980, an economic crisis in Cuba led the Communist regime of Fidel Castro to allow thousands of Cubans to leave the country. Over the course of months, perhaps 125,000 Cubans made the trip from Cuba to the U.S. in a massive, but haphazard, flotilla known as the "Mariel boatlift." Public opinion was positive at first, but soured at reports that Castro had salted the exodus with an admixture of inmates from prisons and hospitals. Partly as a result, relocation was slowed while the "Marielitos" arrivals were vetted and processed at military reservations in Pennsylvania, Wisconsin, Puerto Rico and Arkansas, as well as South Florida. In Arkansas, there were riots at the camp and escapes. The political fallout caused the defeat that fall of the state&apos;s young first-term Democratic governor, Bill Clinton. 1975 — Vietnamese: The fall of Saigon sent hundreds of thousands of South Vietnamese fleeing from the triumphant new Communist regime. Some had the means to travel, while others were forced onto flimsy vessels that were barely seaworthy. They came to be known as "boat people." Many had the U.S. as their ultimate destination, and a young Democratic Gov. Jerry Brown of California resisted their relocation. He even tried to prevent planeloads of refugees from landing in his state at Travis Air Force Base. Brown eventually relented, and Vietnamese have assimilated successfully in California and elsewhere since. Returning to the governorship in 2011, Brown has been a vocal supporter of accepting Syrian refugees. Mid-1950s — Post-WWII Europeans, including Jews who survived the Holocaust: When the Soviet Union was tightening its grip on Eastern Europe through proxy governments run by the Communist Party, President Dwight D. Eisenhower released a plan to bring a quarter-of-a-million asylum-seekers to the U.S. But the end of World War II in 1945 sent waves of refugees in multiple directions. Here again, the popular reaction was resistance. A Gallup poll in 1946 found 59 percent of Americans disapproved of a plan to accept those displaced by the war — including Jews, who had survived the Holocaust. President Harry Truman directed that 40,000 refugees be admitted in December of that year, a number that barely registered against the magnitude of human movement at the time. Late 1930s — European Jews before the Holocaust: Those seeking political asylum from the rise of Nazism in central Europe often wanted to come to the U.S., and some with the necessary means or connections managed to do so. Still, others were turned away. A Fortune magazine poll in 1938 found 67 percent opposed to allowing "German, Austrian and other political refugees" to come to the U.S. That same year, a troubled President Franklin D. Roosevelt convened a 29-nation conference to discuss the Jewish refugees in particular, who were fleeing Hitler&apos;s rise. As one account put it, "If each nation [present] had agreed on that day to take in 17,000 Jews at once, every Jew in the [German] Reich could have been saved." But the conference, which was held in France, accomplished little. The U.S. and Great Britain were not willing to lead the way in accepting substantially higher numbers of Jewish refugees. In one especially notorious case, the ocean liner St. Louis arrived at Miami in 1939, but was not allowed to disembark more than 900 passengers — nearly all of them Jewish refugees. The ship returned to Europe, where many of the 900 would die in the Holocaust. That same year, a Gallup Poll found 61 percent of Americans opposed to taking in 10,000 refugee children, most of them German Jews. 1918 — Post-WWI Europeans: Hundreds of thousands of people tried to come to the U.S. after the end of World War I in 1918. Their efforts merged with the surging immigration that had characterized the decades before the war, bringing waves of Italians, Greeks, Eastern Europeans and Russians to America. These populations found assimilation more difficult than Northern Europeans had before them. This same convergence of concerns is evident in the current panic over Syrians, which bleeds into a more general public unease over immigration in general. For Republican presidential candidate Donald Trump and others, the threat of terrorists arriving among refugees is an extension of a larger resistance to immigration. And that story is nearly as deeply woven into American history as the idea of immigration itself. In the 1850s it was the Irish, driven onto the sea by famine, dispersing to the New World and the Australia. America also greeted many Germans in those same years before the Civil War, fleeing turmoil at home and arriving in force in New York, the Midwest and even frontier Texas. The late 1800s and early 1900s brought the first big waves of Italians, Greeks and Poles, as well as many Jews from Russia and from eastern and central Europe. Chinese, many of them refugees from political unrest in Asia, came in great numbers in this era as well. The U.S. set up a processing camp on Angel Island in the San Francisco Bay that operated from 1910 to 1940. Arriving immigrants from Asia stayed there for vetting and processing that could take many months. 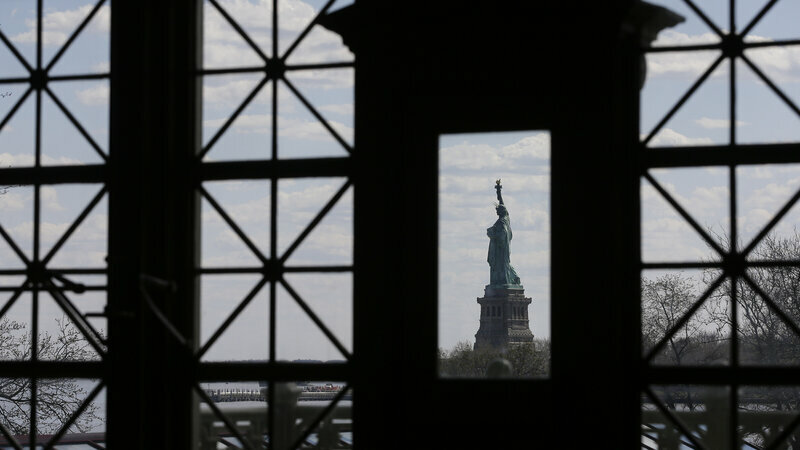 The rates of exclusion for arrivals here was far greater than for Ellis Island, the processing site in New York Harbor, hard by the Statue of Liberty.